Yep, that's me, birthday cake in hand! Today, fifty years. I really like this birthday note I got today. 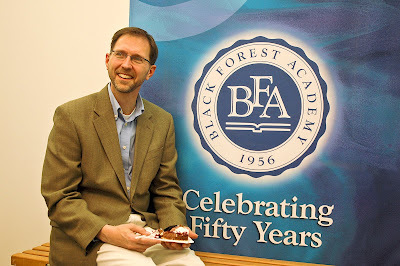 (Yes, it's my birthday - the big 5-0.) 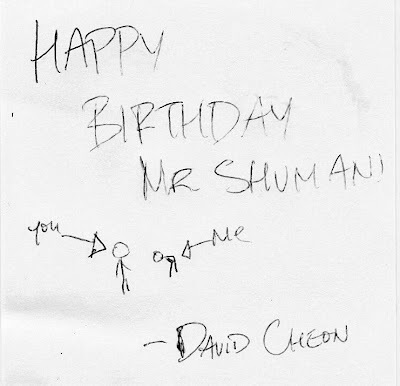 This note is from David one of our grade 12 Korean students. Please take a look at the little stick figures - can you figure out what's going on? Yes, it shows me standing and David bowing to me for my birthday. Now that's a special Korean gift. I love living and working in an international setting. Here's some serious doodling. I did this during a conference session (yes, I was listening) while in Istanbul. Very interesting to just use squiggly lines. There was no planning involved in this little sketch. I had no idea where my pen would go once I started. I think that little bald guy in the middle is Darwin. So, the other day I was in the the Grand Bazaar in Istanbul, Turkey with my wife. Not a good place if you have personal space issues. Have you ever seen a Sea of Humanity? This is it. Wikipedia says it has 4,000 shops, and has between 250,000 and 400,000 visitors daily. I believe it. "Sir, let me help you spend your money!" "Sir, I've been watching you, you look like you need a carpet." "Lady, it’s my turn now. Come see my carpets." "Where are you from? I have friends in Toledo, Ohio! For you, I make a very good price." "My carpets are better than the rest. Please Sir! Just two minutes!" "Do my carpets fly? Yes. You pay me money, for you they will fly." "C’mon lady. You need a carpet – just two minutes. Come look! Listen to me. Have some tea." "Sir, your wife needs a carpet. She pick, you pay. That’s what the man is for!" "Sir, you need to spend your money. The finest carpets are here." PS. We didn't buy a carpet. Just one of 58 "streets" of the Grand Bazaar. 4000 shops! This little clip cracks me up. I followed two guys carrying a sheet of glass through the sea of humanity in the Grand Bazaar. I hope they made it to their destination. This Sunday I attended the worship service at Basel Muenster. 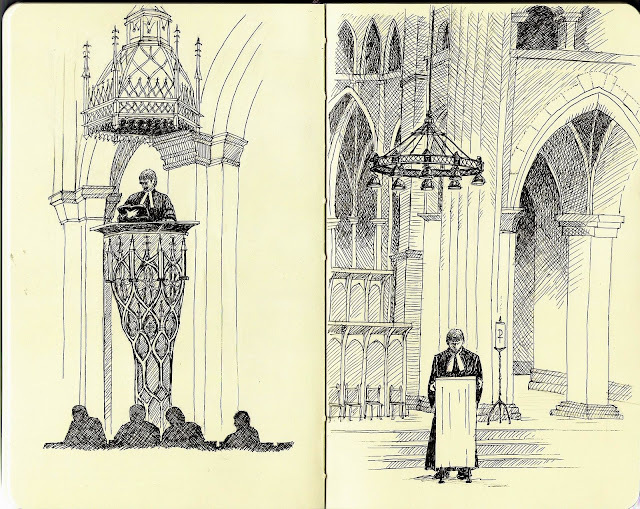 These two Moleskine sketches were done freehand during the service. I added the detail later when I got home. They are a bit unfinished, but I wanted to get something posted this week. I really enjoyed making these. I enjoyed trying to draw the Pastor's black robe and white collar. This was another one of those combination things - worship and drawing. I won't forget this day ever. Obviously, the entire service was in German, so I only understood about 1/2. Still I found the entire service inspiring. The architecture, the organ, the echoing voice of the Pastor in this huge cathedral all contributed to lifting my thoughts to God. So, I admit that I am not used to this kind of service, but I think our modern contemporary worship lacks some of the grandeur and awe that you experience in a Muenster. Worshiping in a cathedral is indeed a special experience. I want to do it more. I found myself looking up a lot during the service trying to take in the entire space. The Basel Muenster is a Protestant church part of the Evangelical Reformed church. Centuries ago, it was a Catholic church, then came the Swiss Reformation and all of the Catholics were kicked out of Basel. Click here to visit the church's website. Oh, and the church bells!! I have to mention those. As you walk toward the cathedral just prior to the service, the bells are amazing - calling you to worship. Nothing like it. And the cool thing is how the bells stop pealing right at 10am. Then there is this moment of quiet, and then the booming organ begins. Stunning! I never experienced anything like this growing up in Summit County. See the little 7 second clip below to hear the bells on the walk to church. 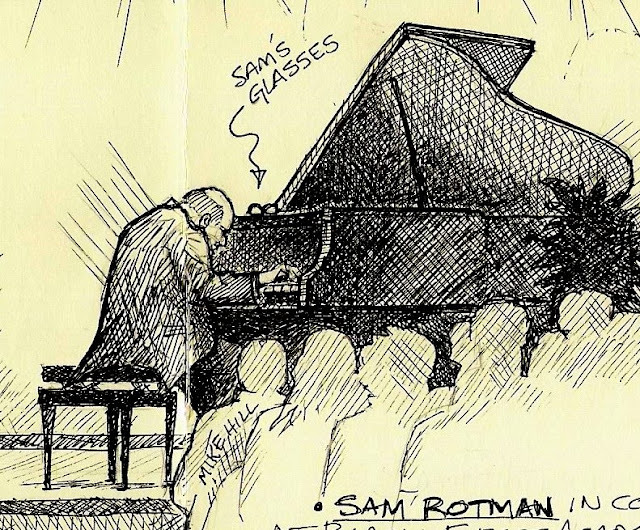 Last night Mr. Sam Rotman gave a piano concert here at our school. What a treat that was. 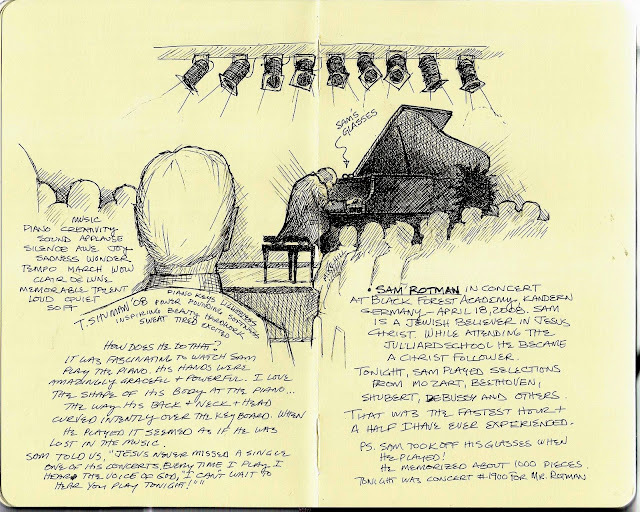 While Sam played the piano I drew in my Moleskine. 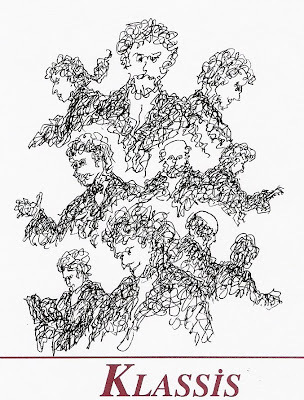 It was a great combination of music and drawing. The hour and a half seemed more like 15 minutes to me. This is a close up of Mr. Rotman at work. I loved the curve of his back and neck as he played. He certainly was "into" his work. I couldn't help but notice how Sam methodically took off his glasses and put them on the piano just prior to playing each piece. Click here to learn more about Mr. Rotman. These are my notes from yesterday's church service. 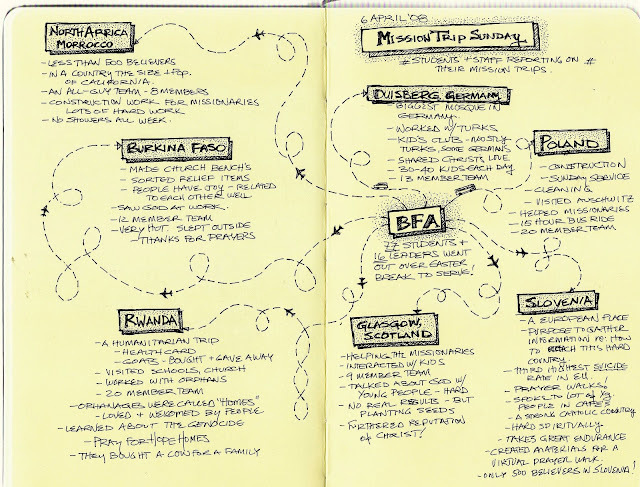 Yesterday we heard reports from the seven mission trips. It was very encouraging service. I enjoyed taking notes this way. I did almost all of this during the service. I cleaned up some of it once I got home. 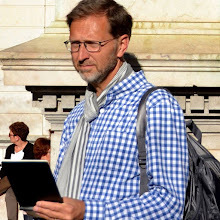 Moleskine notebook. Uniball signo RT GEL 0.38 pen. I just bought this notebook in Switzerland. I am quite impressed with this moleskine-like book. The big difference is the elastic band that goes over the top right corner. Not only does it hold the book closed, it also holds a really cool matching pencil (included with the notebook!). This is one unique book. Apparently, it's only available in Switzerland from Canteo. Sideview - note the all-black pencil. Even the wood is black. Front view - similar feel to the Moleskine, but the elastic band goes over one corner. Why didn't I think of that? Rear view. Note the pencil and the really cool company logo on the back. The company Biella originally made office supplies for the Swiss government. 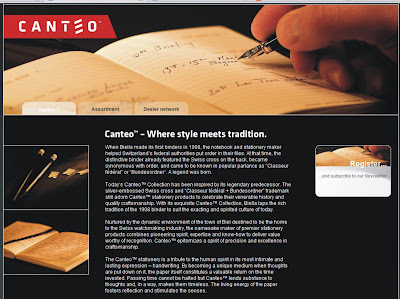 Today their products are available to the average Fritz on the street through a company called Canteo. You can learn more about them at their website. More unboxing of my Federal Bundesordner. Inside the front cover you find a little pocket that holds a set of 5 really cool page markers. Here's a close up of the page markers, the all black pencil, and the company logo. I have to admit that these slick little clips are what attracted me to this book. Aren't they cool? Notice the little Swiss Cross on each one. Don't you want some? They are available separately, but I just HAD to purchase the book with them. The text basically says in French and German, "Federal Binder Collection". As I said, this company used to make the official binders for the Swiss government - not too exciting - but now they have taken the same standards and level of care and applied it to a new and more personal product. Another close up of the page markers. Close up of the page ribbon, book mark/clip, and pencil. Why Blog about a little notebook? Why did I blog about this little notebook? 1) I love paper, notebooks, books, pens - and new ways to keep my things organized. 2) I love things that are unique. 3) I really like things that are excellent and this is one. 4) It's a great combination of craftsmanship, attention to detail and reasonable price. 5) I love that they included a really cool looking pencil and a set of VERY unique page markers. Moleskine doesn't do that. 6) I wanted to show my brother Jim pictures of something that he can't purchase in Ohio - at least not yet. 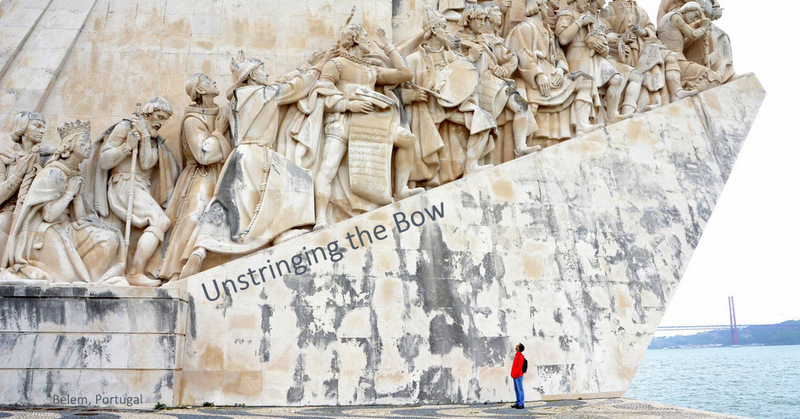 Finally, this is a blog about creativity and seeing God in the world. This item is creative, but I also appreciate that someone in this company took the time to do something right. I believe that whenever we do that - give our best to a product, a plan, or a mission, we honor God - we show some of His DNA shining out through us - His ultimate creation. Isn't this what God meant in Genesis, when he challenged Adam to take dominion? So, when I hold this in my hand, not only am I grateful to those that made this booklet, I am also grateful to God for endowing us humans with the skills to help others.